The reason William Elliott Whitmore’s music is so endearing is because it is so honest and humbled. There are no launched comparisons or metaphors that are too difficult to wade through, just straight up, blue collar life. It is a very midwest sound with songs about farming and hardships and a steady amount of fanfare is given to him when he plays shows in the area. The Waiting Room in Omaha was no exception, it wouldn’t sell out but he would still draw a very strong crowd for just a man and a guitar. He would have a very appropriate opening act this time around in troubadour Austin Lucas. 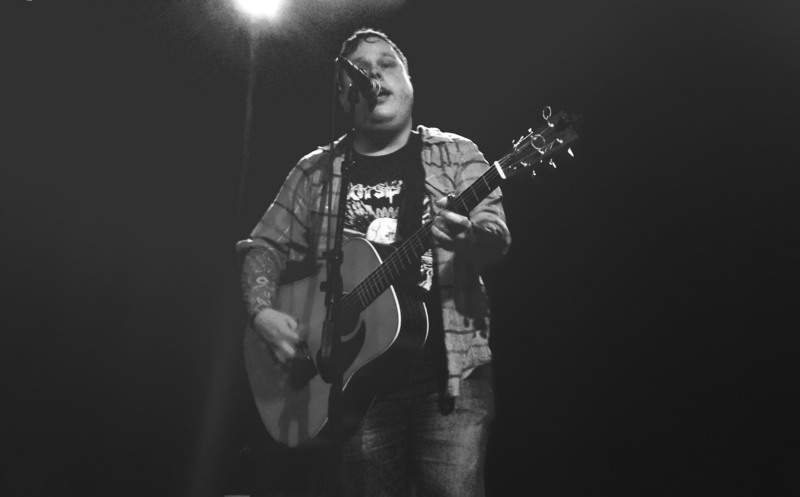 Like Whitmore, Lucas’ arms are covered in tattoos and he just plays solo acoustic for his stage show. It quickly became apparent that he takes a far less serious approach to his concerts than his songs would indicate by constantly cracking jokes. His country twang can be overpowering at times as he delivers his lyrics in a little bit unorthodox manner. He would manage to win over Whitmore’s crowd as the opening act with solid songs and poking fun at himself, at one point after a guitar solo saying “I could’ve done that a lot better, I just thought I’d let you know.” As his stage time dwindled he would get to the serious “Somebody Loves You” to grab attention and immediately best it with “Alone In Memphis” off his new record Stay Reckless that would prove to be a clear highlight. The set would be short but a perfect primer on the night and it is always great to see an opening act that actually fits the bill. Austin Lucas opens for WIlliam Elliott Whitmore at The Waiting Room in Omaha, Nebraska on 4/12/14. Whitmore would come out and set his own instruments up on stage, which was just a banjo, guitar and kick drum. He would ask if he could start playing as opposed to going off stage, showing that pageantry was something he clearly wasn’t interested in. He would have no setlist and seemingly no plan, he would close his eyes between each song and start to pick or strum, improvising his setlist for the whole night on the spot. He’d start with the banjo on “Lift My Jug” and “One Man’s Shame” but he wield his acoustic guitar for the vast majority of the songs. He took requests all night informally and would work them in where he thought they made sense. He struggled with a request for “Porchlight” for about half the set as he repeatedly referenced how difficult it was to get in the right head space to sing a song. “I just don’t know if I feel like going back to that place” he would say as he asked for patience for him to play it. He would bounce back and forth between slow songs and fast tempo tunes powered by his kick drum. Songs like “Johnny Law” and “Don’t Need It” would juice the crowd up and make them frantic before he would bring them back down with a heavy slower song like “Who Stole The Soul” or “Our Dreams Float Like Anchors.” He got around to the slow and burning “Porchlight” toward the end of his set, naturally to a large ovation. He would perform new songs alongside of old songs with possibly his best song “Not Feeling Any Pain” appearing right next to one of his oldest songs “Pine Box” in the setlist. 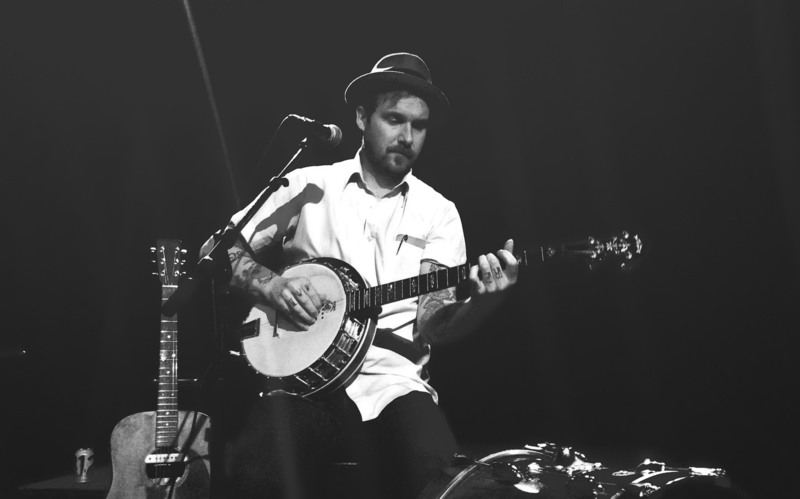 William Elliott Whitmore picks at his banjo at The Waiting Room in Omaha, Nebraska on 4/12/14. He would do a couple non album tracks in “Ol’ Bill Jones” and “Lee County Brew,” the latter promising to be on his upcoming record due out later this year. He would also perform a new song named “Make It Through” that started as a slow burner before shifting into another gear to finish with some help from the kick drum. Whitmore would comment “Have I been up here like two hours?… or 10 minutes, I really don’t know.” as he would keep thumbing through his songbook building on a long set that ended up lasting just under two hours. He would finish strong with one of his fastest songs, “Black Iowa Dirt” then would play his climactic closer “Old Devils” then make a tour around the stage shaking hands. He then ended by standing with just his kick drum and honoring an earlier request for “Mutiny” that would turn out to be an anthemic sing-along. He would shake more hands before commenting “That’s all I got.” Back at his merch table, both t-shirt designs were sold out along with his one LP and two cds he brought, the only remaining merch was a 7″ single so the Omaha crowd would support him well. This entry was posted in Concert Review and tagged Austin Lucas, concert review, Field Songs, Make It Through, Nebraska, Not Feeling Any Pain, Ol' Bill Jones, Old Devils, Omaha, review, setlist, Stay Reckless, The Waiting Room, William Elliott Whitmore. Bookmark the permalink.